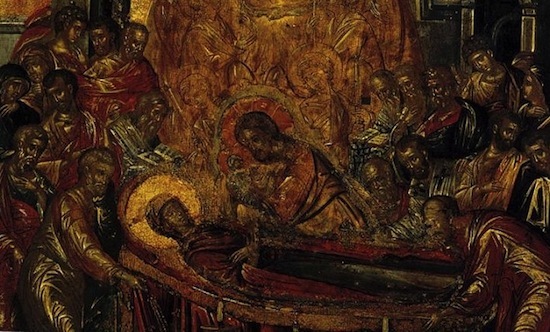 Holy Tradition tells us that all the Apostles, with the exception of St. Thomas, were transported mystically to Jerusalem in order to be with the Mother of God – the Theotokos – as she reposed, and to be present at her burial. When the Apostle Thomas arrived the next day, the Apostles opened the tomb so that he could kiss her farewell. As the tomb was opened, the body of the Most Pure Virgin was missing, and the cave was filled with flowers and the sweet fragrance of Paradise. This was a sure sign of her great purity and holiness to the faithful. Therefore as part of our celebration of Dormition we bless flowers and fragrant herbs – and the faithful traditionally keep them in their homes. The herbs, used as natural medicine, are blessed in commemoration of the numerous healings and the extraordinary grace bestowed on the pilgrims at the blessed tomb of the Mother of God. During times of family strife or illness, it is a pious custom to place the flower petals in the house censer, together with the incense, and cense the whole house with it.